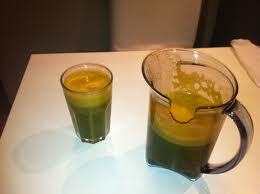 Kicking Green Juicing Recipe KCeTCAP ~ The Reluctant P.O.W. 1 tomato or V8 - 85g/4oz. Run all ingredients through a juicer. De-seed the Anaheim or Pablano pepper. Try this as a bloody mary also. Here's the approximate nutrition in this drink(based on USDA data)(no V8).